New Line Theatre, “the bad boy of musical theatre,” announces its 28th season of adult, alternative musical theatre, including the world premiere of THE ZOMBIES OF PENZANCE, Gilbert & Sullivan’s newly discovered, original “operatic abomination,” in its first ever production, running Sept. 27-Oct. 20, 2018; followed by the “family values” classic musical LA CAGE AUX FOLLES, running Feb. 28-March 23, 2019; and to close the season, the St. Louis premiere of the new sci-fi rock musical BE MORE CHILL, based on the bestselling novel, running May 30-June 22, 2019. All New Line’s mainstage shows will be in the company’s home, the Marcelle Theater, in the Grand Center Arts District. New Line Theatre Off Line will also continue the Off Line at the Monocle cabaret series, under the direction of associate artistic director Mike Dowdy-Windsor. New Line also continues its partnership with the Webster University Department of Music and their Bachelor of Music in Music Direction for Musical Theatre degree program. The dead aren’t just walking — they’re SINGING! New Line Theatre has shocked the music world by discovering a controversial, long-lost first draft by the legendary British team of librettist W.S. Gilbert and composer Arthur Sullivan, who together wrote fourteen comic operas between 1871 and 1896. One of the team’s best known works, The Pirates of Penzance, originally debuted in New York in 1879, and was revived to great success in the early 1980s with Kevin Kline, Linda Ronstadt, and Rex Smith. What we now know is that there was an earlier, stranger draft of the show, which nobody knew about, with most of the same characters but a somewhat different plot. Until now, music scholars had been baffled by that reference. In 2013, New Line Theatre artistic director Scott Miller discovered the original manuscripts for The Zombies of Penzance in the second sub-basement of the Judson Memorial Church in New York, hidden beneath some moldy band parts from Rockabye Hamlet and Shogun the Musical, and Miller set about reconstructing the bizarre original show as G&S intended. Gilbert’s walking dead and their Zombie King now make their long-delayed world premiere. Miller has painstakingly reassembled these rediscovered materials into their original form, filling in the gaps with educated guesses based on other G&S shows and drafts. St. Louis composer and orchestrator John Gerdes is reconstructing Sullivan’s music. Now, for the first time, audiences will be able to see and hear the comic, flesh-eating insanity Gilbert & Sullivan originally wrought. The show opens New Line season in October. 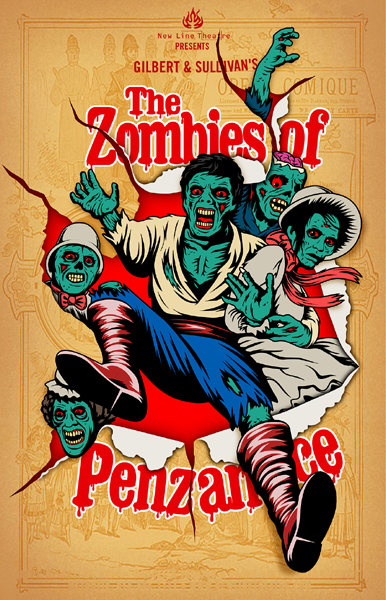 The cast of New Line’s Zombies of Penzance includes Sean Michael as Frederic, Melissa Felps as Mabel, Zachary Allen Farmer as Major General Stanley the Zombie Hunter, Dominic Dowdy-Windsor as the Zombie King, with Mara Bollini, Kent Coffel, Kevin Corpuz, Robert Doyle, Evan Fornachon, Joel Hackbarth, Matt Hill, Lindsey Jones, Melanie Kozak, Sarah Porter, Christina Rios, and Kimi Short. The show will be directed by Scott Miller and Mike Dowdy-Windsor, with music direction by Sarah Nelson, scenic design by Rob Lippert, lighting design by Kenneth Zinkl, costume design by Sarah Porter, and sound design by Ryan Day. Come join us on the French Riviera for a night of love, laughs, illusions and truths, and the triumph of family over bullies and bigots. New Line continues its season in March 2019 with Jerry Herman and Harvey Fierstein’s subversive comedy about real family values in a world that doesn’t always value family. In its original 1983 production — before gay marriage was legal — the show was a safely old-fashioned musical comedy. But in its 2008 London revival and 2010 Broadway revival, the show was transformed from a genial comedy into a more serious story with laughs. Without rewriting it, LA CAGE AUX FOLLES has become a 21st-century musical — and a New Line show. Based on the 1973 French play and its 1978 film adaptation, LA CAGE AUX FOLLES tells the story of a middle-aged show business couple, grappling with aging, fidelity, kids, and holding on to their dignity when the world around them would rather strip it away. At the center is Georges, a St. Tropez nightclub owner, and his husband Albin, who is also the club’s erratic drag headliner Zaza. When Georges’ son gets engaged to the daughter of a right-wing politician, all hell breaks loose — and suddenly we can see 2018 in the politics and culture war onstage. The original 1983 Broadway production ran four years and 1,761 performances. The show received nine Tony nominations and won six, including Best Musical, Best Score and Best Book — beating out Sondheim’s Sunday in the Park with George. It’s been revived on Broadway and in London multiple times. The intimate New Line production will be directed by Scott Miller and Mike Dowdy-Windsor, with scenic and lighting design by Rob Lippert, costume design by Sarah Porter, and sound design by Ryan Day. What if one pill could completely change your life? New Line closes its season in June with the new sci-fi rock musical BE MORE CHILL, with music and lyrics by Joe Iconis and book by Joe Tracz, based on the bestselling novel by Ned Vizzini. Jeremy is just an average teenage nerd. Until he finds out about the Squip (“Super Quantum Unit Intel Processor”), a tiny Japanese supercomputer — in a convenient pill taken with Mountain Dew — which promises to “upgrade” him and bring him everything he desires most: a date with Christine, an invite to the coolest party of the year, and a chance to survive life in his suburban New Jersey high school. But is being the most popular guy in school worth the risk? What would you do? New Line’s local premiere will be directed by Mike Dowdy-Windsor and Scott Miller, with scenic and lighting design by Rob Lippert, costume design by Sarah Porter, and sound design by Ryan Day. Season tickets for New Line’s 2018-2019 season will go on sale in May. Single tickets will go on sale in August. All mainstage shows run Thursday, Friday, and Saturday evenings, at 8:00 p.m., at the Marcelle Theater, 3310 Samuel Shepard Drive, just three blocks east of Grand, in the Grand Center Arts District. (See our website for directions.) The first Thursdayof each run is a preview. Tickets for mainstage shows are $25 for adults and $20 for students/seniors on Fridays and Saturdays; and $20 for adults and $15 for students/seniors on Thursdays. For other information, visit New Line Theatre’s full-service website at NewLineTheatre.com. All programs are subject to change. New Line Theatre is a professional company dedicated to involving the people of the St. Louis region in the exploration and creation of daring, provocative, socially and politically relevant works of musical theatre. New Line was created back in 1991 at the vanguard of a new wave of nonprofit musical theatre just starting to take hold across the country. New Line has given birth to several world premiere musicals over the years and has brought back to life several shows that were not well served by their original New York productions. Altogether, New Line has produced 83 musicals since 1991, and the company has been given its own entry in the Cambridge Guide to American Theatre and the annual Theater World. New Line receives funding from the Regional Arts Commission and the Missouri Arts Council, a state agency. New Line’s current season continues with the classic satire Anything Goes, running March 1-24; and the St. Louis premiere of Yeast Nation, running May 31-June 23. For more information, visit www.NewLineTheatre.com.